NAMM 2019: Slowly but surely, a new MIDI spec is being born, and the MIDI Manufacturers Association (MMA) and Association of Music Electronics Industry (AMEI - the Japanese MIDI association) have now confirmed that it has a name. With drums rolling, we can confirm that it’ll be called MIDI 2.0 - the meeting to decide on that must have been pretty short - and member companies are now working together to develop prototypes based on a jointly-developed, feature-complete, draft specification. These companies include Ableton/Cycling '74, Native Instruments, Art+Logic, Bome Software, Google, imitone, Roland, ROLI, Steinberg, TouchKeys, and Yamaha. As with the development of MIDI 1.0, the MMA and AMEI are working together and sharing code so as to streamline the process, with prototyping set to continue during 2019. Work will also be done on a new logo and on creating a self-certification program for those companies involved. Highlights of MIDI 2.0 should include auto-configuration, new DAW/web integrations, extended resolution, increased expressiveness, and tighter timing. Backward compatibility with MIDI 1.0 devices is also a key concern. 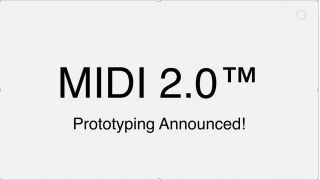 We look forward to hearing more about MIDI 2.0 - and getting a peep at that logo - as it develops. As things stand, the proposed spec is only being shared among AMEI and MMA members, as it may change during testing, with these companies set to meet at NAMM to test compatibility between some early MIDI 2.0 prototypes. Once finalised, the spec will be available for free on the MIDI Association website.